Are you ready...ready to read all about a dynamic duo? I hope so because we are Bella Rose and Buddie Boy, two awesome inseparable Puggles that you can’t help but love! I’ll start because I like to be in charge, not in a bad way, but someone’s gotta take the lead! My name is Bella Rose and I am a beautiful 6-year-old Fawn girl with a love for cuddles and chew toys. I can multi task and chew on a toy while snuggled up close to you! I am an expert at going potty where I am supposed to. I walk very nicely on a leash and I don’t pull at all. I have great mealtime manners. I eat my food and don’t try to get into anyone else’s bowl. Buddie Boy and I chill in the kitchen when no one is home. We are so good that we don’t need no stinkin’ crate! At bedtime, you will find me buried in the covers on my foster human’s bed! To summarize, I’m a house trained, snuggly girl that loves chew toys and Buddie boy of course! If Bella Rose can quit jabbering for a minute, I’ll tell you all about myself! My name is Buddie Boy and I kinda of just go with the flow 9-year-old guy. Bella Rose likes to be in charge and I am cool with that because I love her so much! We are very similar. I am house trained and walk very nicely on a leash. I eat my food pretty fast, but I leave everyone else’s food alone. Toys...I can take em or leave em, but Bella Rose usually takes them when I leave them. I am a little more of an adventurer in the backyard and like to explore. I sleep in the big bed at nighttime and don’t disturb anyone. We are quite the pair, always up for snuggles and walks. So...if you are looking for a dynamic duo to add to your life, you found us! Why have one Puggle, when you can have two awesome Puggles?!? Go to the DFW Pug Rescue website and fill out the application. 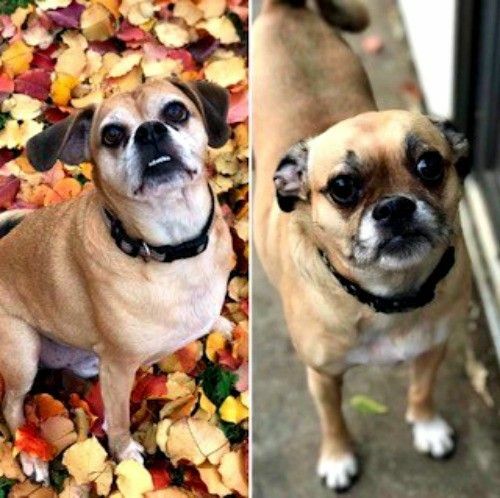 Make sure you put our names as the Puggles you want to adopt, Bella Rose and Buddie Boy! Not what you were looking for? You can adopt a different pet in Grapevine by using our search feature and adjusting the radius. Thank you for helping our animal shelters and rescue groups with pet adoption! DFW Pug Rescue Club, Inc., (DFWPRC) was incorporated in July 1997 as a non-stock, non-profit corporation for the rescue, care, and placement of unwanted, mistreated, or homeless pugs in Texas. DFWPRC is the largest pug rescue organization in the United States and has rescued and placed over 3,800 huggable, squeezable, absolutely adorable pugs â we rescue approximately 10 pugs a week. We rescue ALL pugs regardless of age or medical condition. Since we rescue ALL pugs, our veterinary care is our biggest on-going expense and we average approximately $100,000 a year in veterinary expenses. This amount is after our veterinary care clinics provide deep discounts. 100% of all funds donated to DFW Pug Rescue are used to pay for Veterinary care. All pugs rescued by DFWPRC are taken immediately to the vet where they are examined, tested (and treated) for heartworm, vaccinated, sterilized, and rabies shots administered before being placed in a foster or permanent home. 70% or the rescue pugs are heart worm positive and all are treated at DFWPRCâs expense DFWPRC is an all-volunteer non-profit organization and do not have a staging area to hold our rescue pugs so we depend on the generosity of our volunteers to provide foster homes until permanent homes can be located. DFWPRC has placed pugs in 26 states, British Columbia, Canada, Germany, and Japan. All pugs must be picked up in Dallas/Fort Worth or Houston by their new families â no pugs are shipped. The majority of our pugs are owner surrender due to military deployment, death, divorce, relocation, new baby, marriage, travel, and estate placements. DFWPRC is not affiliated or sponsored by any national or local breed clubs. We rescue more males than females (10 to 1), more fawns than blacks (40 to 1), and the average of our rescue pugs is 4-years old. The average life span of a pug is between 14 â 17 years. We maintain a Certificate of Good Standing with the Texas State Comptrollerâs Office. DFW Pug Rescue Club, Inc. is a non-profit corporation with Federal Tax Exemption as a public charity under Section 501 (c) 3 of the Internal Revenue Code.